Sometimes I run into the objection that my acceptance of rationalism is as much of a faith-based statement as anyone's declaration of belief in a religion. In one sense, this is true. I have concluded that the world is explainable through rational means not by any rational argument. The only way that would work is if you've already accepted that rational arguments lead to the truth, tying you up in a neat little bit of circular reasoning. On the other hand, we rationalists do have one thing going for us; scientific rationalism has a pretty good track record of making accurate predictions about how the world works. Say whatever else you like about it, science certainly does provide consistent explanations that line up well with whatever evidence we have. As Tim Minchin put it, "Out of all of the great mysteries ever solved, none of them have ever turned out to be magic." It's telling, I think, that even the most diehard religious folks accept most of science's conclusions and technology's innovations -- except the specific few that happen to contradict their religious convictions. Interesting, isn't it, that the scientific method can lead to right answers in the case of airplanes, computers, and modern medicine, and wildly wrong ones when it comes to, for example, evolution? In any case, my main argument for rationalism is: it seems to work. This is why, when I am presented with a mystery, I immediately jump to one conclusion -- there has to be a rational explanation. I may not know what it is; I might never figure it out. But I am certain that there is a reasonable, scientific explanation for what we're seeing. Take, for instance, the case of the spinning Egyptian relic. Scientists who explored the Egyptian tombs in the 1920s were popularly believed to be struck by a ‘curse of the Pharaohs’ – and Campbell Price, a curator at the museum on Oxford Road, said he believes there may be a spiritual explanation to the spinning statue. Egyptologist Mr Price, 29, said: “I noticed one day that it had turned around. I thought it was strange because it is in a case and I am the only one who has a key. “I put it back but then the next day it had moved again. We set up a time-lapse video and, although the naked eye can’t see it, you can clearly see it rotate on the film. 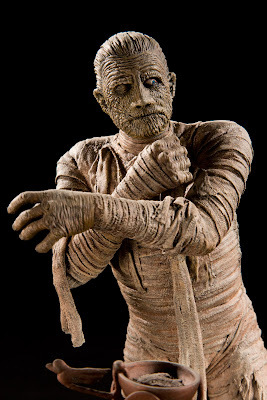 The statuette is something that used to go in the tomb along with the mummy. “Mourners would lay offerings at its feet. The hieroglyphics on the back ask for ‘bread, beer and beef’. First of all, if this is a curse, it's a pretty pathetic one. Can't you see Neb-Senu, back almost 4,000 years ago, saying as he's on his deathbed, "If my statue ends up on a museum shelf in England, and no one brings me bread, beer, and beef, I hereby pronounce the following curse: my spirit will go there, and make the statue slowly turn round and round! Ha! That will sure show them!" I mean, come on. If this is some sort of "Mummy's Curse" kind of thing, you'd think he could do better than that. 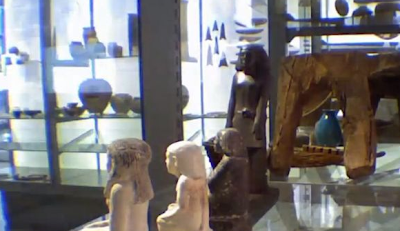 The statue is hard uneven stone, and the glass shelf is very hard and perfectly flat. When two hard substances are in contact with each other, then there's not much friction because there are limited points of contact. I suspect that the base of the statue is uneven, which allows it to tilt and pivot very slightly from the vertical vibration from people walking by. 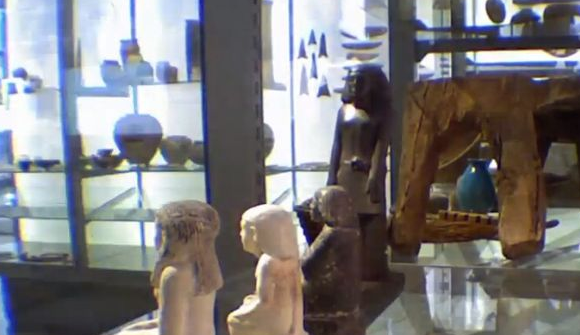 The shelf is very slightly tilted towards the front, so the statue rotates until the center of gravity is at the lowest point, and then it stops. This, by the way, also explains why the statue only rotates during the day, and not at night -- when the museum is empty. So, my general feeling is: rationalism wins again. But, of course, you knew I'd say that.